Able Sail/Handi-Voile offers the following products. The proceeds from the sales benefit its sailing program. The CD, titled Georges Hebert/Jamie Colpitts - Standards for Sail, features jazz pieces performed by Georges and Jamie, two of Atlantic Canada's most accomplished guitarists. Can be picked up in Shediac area. Call George Richard at 533-7891 or Don Boudreau at 532-8019. In the Moncton area, call Maurice Richard at 382-8216. If you prefer to have it shipped, send us this form. 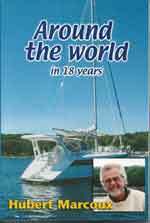 This book tells the story of a trip undertaken by Hubert Marcoux, a native of New Brunswick, in a sail boat around the world. The trip began in September, 1985 and ended in August, 2003. Mr. Marcoux has since been lost at sea, presumed to be dead. His family donated the remaining copies of the book to Able Sail/Handi-Voile. The proceeds of the sales will benefit Able Sail's sailing program.